Killing zombies = real fun. The site/contest seems like some promotion for resident evil on Ngage. I haven't gone through the TOC of this contest and I really don't care about it (the contest), I just wanted to see how do I look as a Zombie. 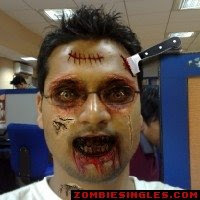 Just log on to zombisingles.com and get urself zombified. Is Nokia losing it? : This guy 'dextroz' in 10 mins made a comment which is twice the size of the actual post and still its interesting. The case of iPhone is Strong : This is a really well written post and would make any reader go ga-ga about the iPhone. But wait, just go thru the comments and your thoughts might again change.